Dates of birth and death unknown. Disciple of Kirinami Senju I, he started his career in Kyôto in 1698, performing as a wakaonnagata. His rank in the 1705 Kyôto hyôbanki, wakaonnagata section, was naka no jô (superior in the middle class). He performed in the 1st lunar month of 1706 in the new year drama "Keisei Nezamegaseki", which was staged in Kyôto at Kameya Kumenojô's theater. No record afterwards. Dates of birth and death unknown. Disciple of Kirinami Takie, he was recorded as performing as a wakaonnagata in the 1st lunar month of 1707 in Kyôto at Miyako Mandayû's theater in the ni-no-kawari drama "Keisei Kiba no Ume". He went to Edo with his master in Winter 1712 and played in the 1st lunar month of 1712 at the Ichimuraza the role of Ninomiya in the new year drama "Soga Kantan no Makura". 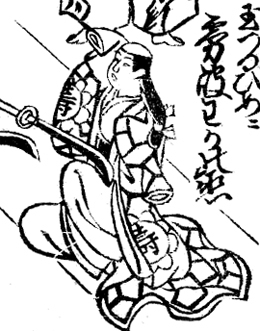 His rank in the 1712 Edo hyôbanki, wakaonnagata section, was naka no jô (superior in the middle class). No record afterwards. Dates of birth and death unknown. He was recorded in the 1st lunar month of 1712 as performing in Kyôto as an iroko (wakaonnagata). He became wakaonnagata in Kyôto in the 11th lunar month of 1714, performing in the kaomise drama "Azuma-zukuri Ôdaidokoro", which was produced at Kameya Kumenojô's theater by Sakakiyama Shirotarô I. He took the name of Kirinami Wakanojô in the 11th lunar month of 1717 at the at the Naka no Shibai, playing the role of Princess Tamazuru in the kaomise drama "Inari Yashiki Daikoku Bashira". No record afterwards.